Made of heavy black material, these bags are approx. 19" x 8" when zipped up (approx. 16" wide when opened). The inside pouches are approx. 11.5" deep, they can comfortably hold whistles up to 17" long. Whistles shown above are not included. When transporting multiple whistles in the same pouch compartment, it's usually a good idea to wrap your favorite whistles in pieces of soft cotton (pieces of an old T-shirt, for example), to avoid scratching. 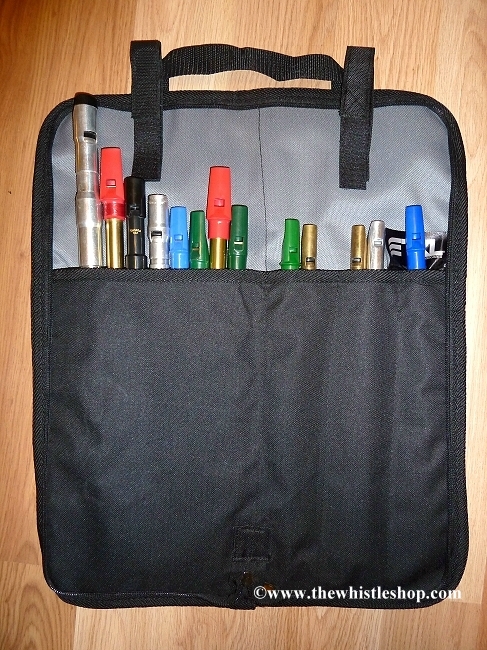 The gray panel on the front of the bag is a zippered pouch; it's just the right size for caring your basic whistle supplies (polishing cloth, plumber's tape, tuner, etc.). ~ TKL can have spotty delivery on these bags from time to time. If we're out of stock on the model shown, we will substitute one from a different manufacturer, of equal size and quality (and of equal or greater value).